Wildlife holidays provide photographers with wonderful opportunities, as well as the chance to hone their craft. When the adventure is over, they can relive the experience through their photography, and share these cherished memories with friends and family! Capturing good wildlife photos is not easy, and wildlife holidays pose many challenges for photographers. Wildlife cannot be guaranteed to be co-operative, windows of opportunity are often brief, and good weather and light cannot be assured. Tom Ambrose and Tim Melling, both avid wildlife photographers, have put together 10 top tips for capturing memorable images. Most wild animals are hesitant to venture far from cover. Predators must conceal themselves as they stalk prey, which themselves must try to avoid being eaten, either by not being spotted in the first place, or by escaping effectively. Cover, often in the form of vegetation, can be a distracting element to a photographer and in the worst cases, can even make it hard to find the intended subject! Long lenses coupled with a wide aperture are an excellent solution to this problem. When focused correctly, they will render the subject on a blurred, out of focus background (illustrated in the picture below). As both lens length and aperture increase, depth of field decreases, and many professionals carry huge lenses for this reason. These can be prohibitively expensive, but fortunately there are other options available. For DSLR users, telephoto zoom lenses such as the popular 70-200mm or 100-400mm are relatively cheap and allow for creative use of depth of field. Many of our clients also achieve fantastic results with relatively cheap super-zoom bridge cameras. 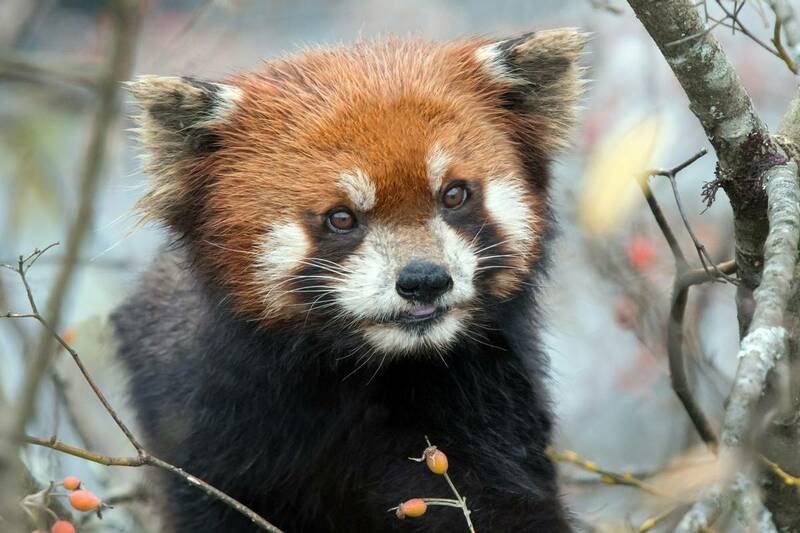 Red Panda, China (Tim Melling). By using a long lens and wide aperture, a narrow depth of field has been achieved, blurring what would otherwise be distracting foliage. This image was made on our 'Wild China – Sichuan's Birds and Mammals' tour. Humans are mysterious to wild animals and must seem rather capricious. Most animals will consider you a threat, and indeed many animals will have experienced human hunters, either in the present day or in their evolutionary history. If you wish to get close to your subject, and not affect its behaviour, it is important not to behave as a predator would. If you move directly towards your target, it is likely to move away. It can even help not to fix your gaze upon your subject, but instead to act disinterested. Sitting quietly and waiting for the animals to come to you can be surprisingly effective, especially with birds. Butterflies and other small animals can be less skittish, but still require slow, gentle movements in order to get close enough for macro photography. Puma cub, Chile (Tom Ambrose). Puma cubs follow their mother but often lag behind, especially when playing with a sibling! One day when the family was moving along a shoreline, I moved behind cover and looped ahead. I sat in wait at a carefully chosen spot, until the cubs walked close by. 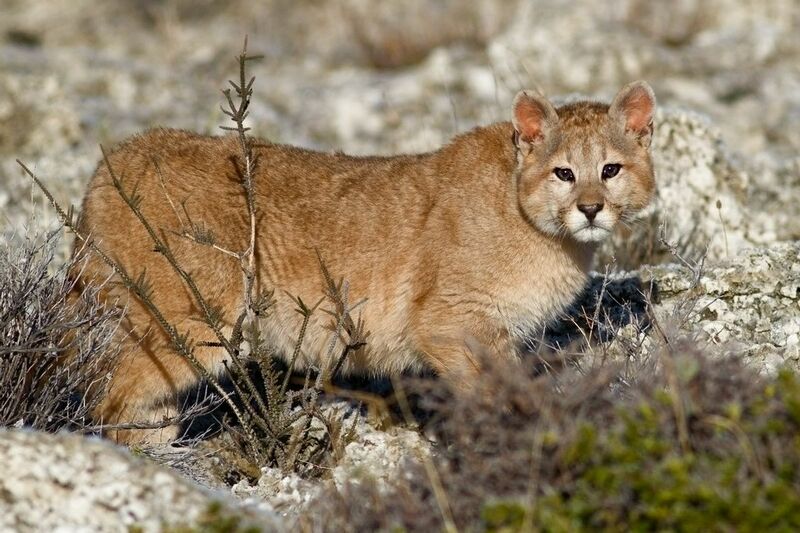 To see Pumas in the wild, try our 'Chile – Just Pumas' tour. Wildlife moments are often fleeting, so being ‘quick on the draw’ is vital. Most photographers keep their camera on a standby setting (rather than switching it off), allowing them to capture an unexpected opportunity almost instantly. Familiarity with camera controls is also important, as quick adjustments often need to be made on the fly. Not having to look down at your camera can be the difference between capturing these moments effectively or missing them completely. 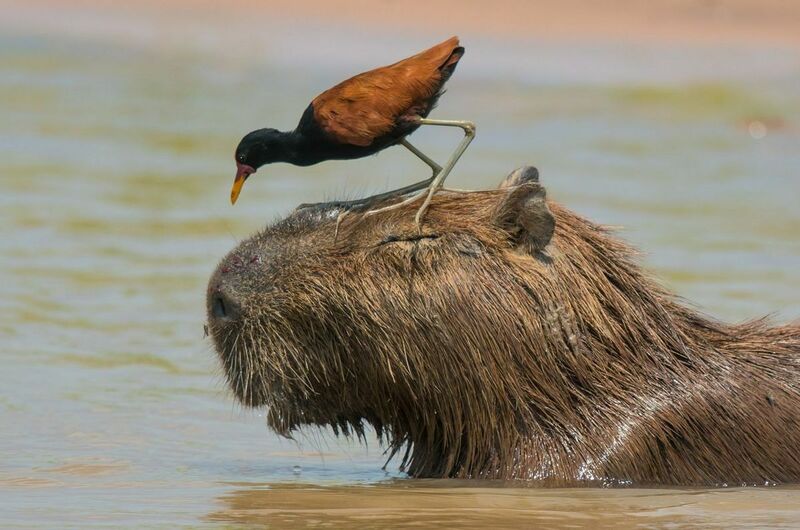 Capybara and Wattled Jacana, Brazil (Tim Melling). By being 'quick on the draw' and familiar with his camera's controls, Tim was able to capture this compelling moment before it passed. This image was taken on our 'South America's Big Cats' holiday. A sudden burst of light is likely to startle a wild animal and cause it to flee, causing stress to both the photographer and the subject! Unless carefully controlled, flashes produce harsh, unnatural light, which is the opposite feeling to the one wildlife photographers generally wish to convey. In low-light conditions, a tripod and image stabilization are excellent weapons in the photographer’s arsenal. Be careful though, as the resulting slow shutter speed will only prevent inherent motion blur from the movement of the camera. It won’t freeze an animal’s motion! By using a high ISO, Tim was able to capture this image without a flash; the only light source was a dim light used to illuminate the area in front of his hide. 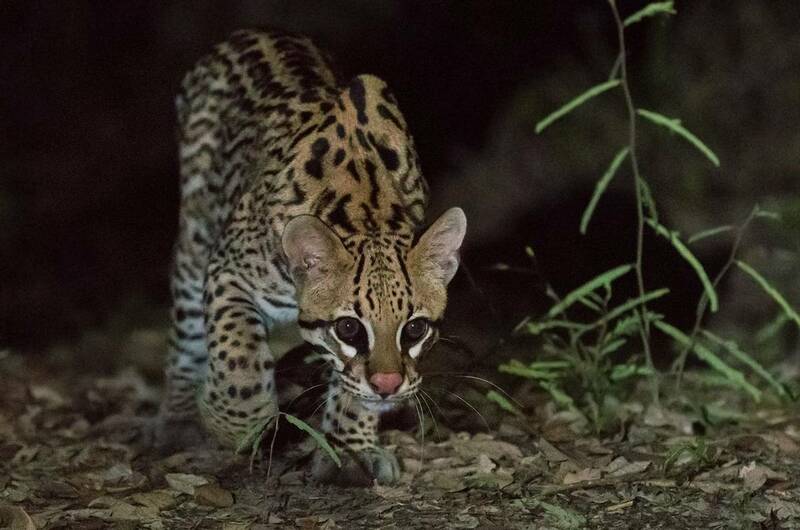 Using a flash may have scared this shy, nocturnal animal away, created heavy shadows and given an odd shine to the Ocelot's sensitive eyes. This image was also taken on our 'South America's Big Cats' holiday. When there is enough light available, a fast shutter speed can be used to freeze the motion of fast-moving animals. Hummingbirds in particular require very high shutter speeds (e.g. 1/4000) to freeze their rapid wing beats. Intentionally using slow shutter speeds can add compelling motion blur to the photograph. Experimentation is important here, as motion blur generally works best when important components of the image are sharp, providing an ‘anchor’. This effect can be achieved with flying birds with smooth panning, keeping up with the bird’s trajectory as the shutter is triggered. 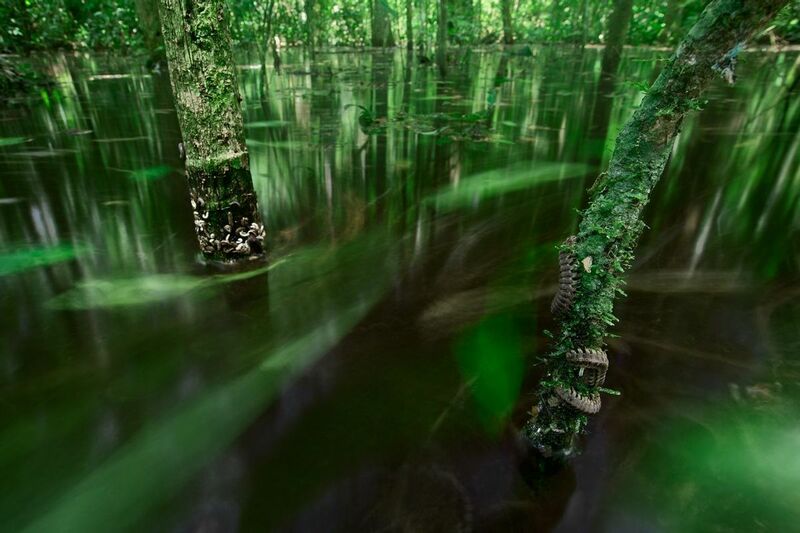 Flooded Forest, Peru (Tom Ambrose). Here I used a tripod and a 30 second shutter speed to blur the slow-moving water in this flooded Amazonian rainforest. The motion blur created by the moving water helps to de-clutter the image, and leads the eye to the soil dwelling biota, which have climbed the trees to escape the flood. This photo was taken at the Amazon Research and Conservation Centre, visited on our 'Birding the Peruvian Amazon' and 'Peru's Rainforest Mammals' holidays. Macro photography can provide an interestingly novel perspective into the lives of small reptiles and insects, which often go unnoticed. A huge advantage of macro photography is that there is never a shortage of subjects. Whether we like it or not, insects and other invertebrates are always close by; Tigers and Polar Bears generally aren’t! DSLR cameras generally require a separate dedicated macro lens for close-up photography, while on the other hand, many mirrorless cameras have a macro setting built in. Telephoto lenses can even be used, provided they have an adequate minimum focusing distance. Macro photography forces you to get close to your subject, so it is important to move slowly and avoid sudden movements, as explained above. Butterflies are excellent subjects for macro photography, as they have a proclivity for beautiful flowers, and their wings often display colourful, intricate patterns. A wide aperture often works well, as long as the plane of the butterfly is adjacent to the objective lens (each part of the butterfly is equidistant from the camera). This will ensure that the entire butterfly is sharp. 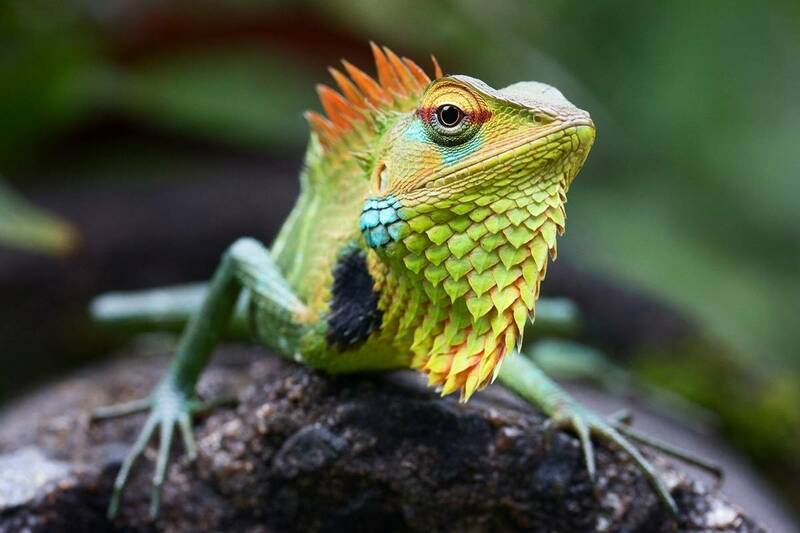 Green Forest Lizard, Sri Lanka (Tom Ambrose). Getting close with a macro lens has revealed stunning colours and textures, which otherwise wouldn't be discernable. It also unintentionally caused the lizard to extend its dewlap (skin folded in the throat area), adding further intrigue. This image was captured in Sinharaja Forest, visited on many of our tours to Sri Lanka. The word photograph derives from the Greek “photo” (light) and “graphe” (drawing), so this is perhaps the most important tip of all! Light can turn a good photograph into a great photograph, and for this reason many photographers go out during the ‘golden hour’ at dawn in search of dramatic results. Only using your camera at dawn and dusk on a dedicated wildlife holiday would be tremendously wasteful, so it is important to understand how to make the most of changing lighting conditions. A general rule in photography is to keep the sun behind you, but many wildlife photographers prefer the dramatic effects that backlighting lends to an image. Whale blows look particularly dramatic when backlit against a dark background. Different lighting conditions evoke different emotions, and knowing which will work best for your subject, and the feeling you wish to convey, is vital. Backlighting and rim lighting work well for furry animals, especially those with an interesting silhouette. Warm light emitted when the sun is low on the horizon will lead to an emotionally ‘warm’ photo. Diffuse light from an overcast sky is excellent for colour and definition, which are important in macro photography. Harsh, midday light can even be used to create striking black and white images! 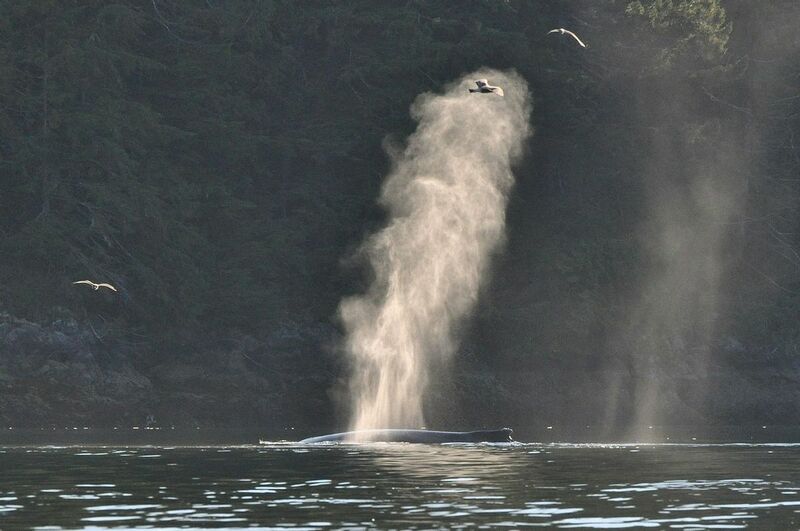 Humpback Whale, Canada (Tim Melling). Backlighting brings life to this photo, by providing a warm glow to the whale's blow. This has caused it to stand out in stark contrast with the dark forest background, drawing the viewers' attention. This photo was made on our 'Canada: The West' tour. Backgrounds can make or break an image. A busy background can distract the eye from what you want to illustrate, while a background that is more colourful than your subject can have the same effect. Nevertheless, the environment around an animal can provide important context, and good results can be achieved either by using a wide-angle lens or making the animal a smaller component of your photograph. 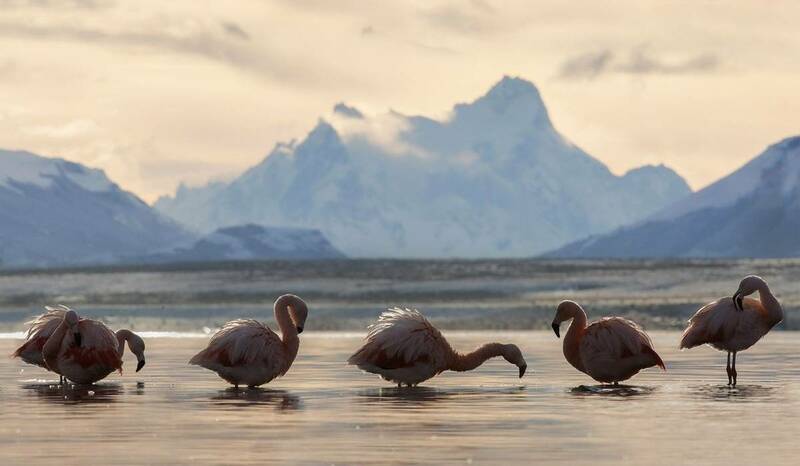 Chilean Flamingoes, Chile (Tom Ambrose). The stunning backdrop of the 'Paine Grande' mountain adds interest and context to the image. A telephoto had to be used to frame the flamingoes with the mountain, but a narrow aperture prevented the mountains from being rendered as an indeterminate blur! Visit this spectacular location on our 'Best of Chile' tour. Many photographers get so caught up in their search for the ‘perfect shot’ that they regularly become frustrated when their dreams aren’t realised. It should go without saying that nobody has ever taken a ‘perfect shot’, as photography is subjective! What is important is that you can express yourself through this wonderful medium and enjoy the learning process. Everyone takes bad photographs, and it can be fun to laugh at your own mistakes! Polar Bear, Spitsbergen (Tim Melling). Don't let photography be the only reason for your holiday; having a general appreciation for wildlife watching will allow you to enjoy the moments you missed with your camera. 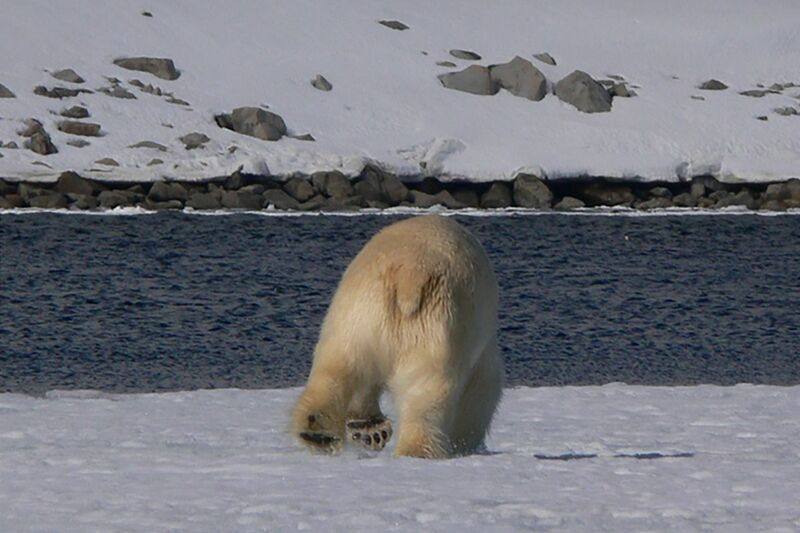 Tim photographed this Polar Bear's rump on our 'Spitsbergen – Realm of the Polar Bear' holiday. 10. Visit a new location! This suggestion might seem a little self-serving – of course we want you to join us on one of our exciting tours! Photographing the same locations and subjects can stifle creativity, visiting a new location can be an inspirational antidote! We have an exciting portfolio of photography tours, designed to put you in the right place at the right time. Coupled with expert tuition from a professional photographer, you’re sure to capture some memorable moments, whilst improving your technique and eye for compostion along the way! 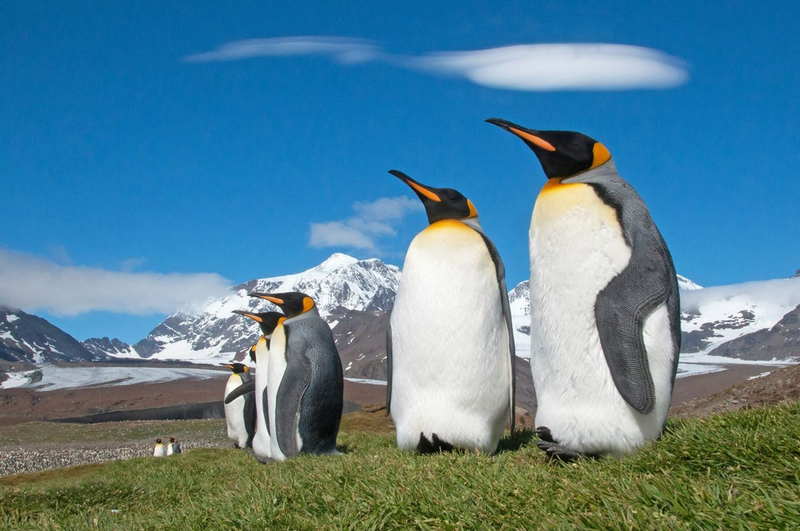 King Penguins, South Georgia (Tim Melling). Group photography tours provide a forum for sharing new ideas on technique and composition, all while surrounded by wildlife! What better way is there to enhance your creativity? This photo was captured on our 'Antarctica, the Falklands and South Georgia cruise'.